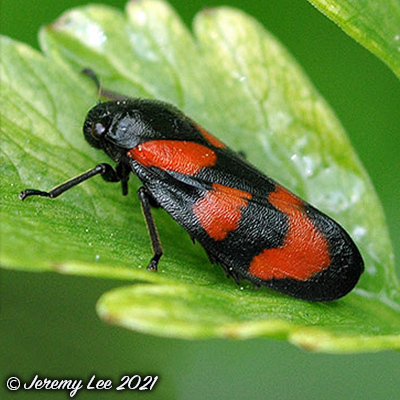 With a length of 9-11mm, Cercopis vulnerata, more commonly known as the Red and Black Froghopper, is a truly unmistakable species; it is very commonly found resting on the stems of grasses and other low-growing plants and is one of our largest homopterans. Found in a variety of wooded and open habitats, grassland, meadows etc. The nymphs are rarely seen, as they feed on underground roots, rather than leaves or stems. Adults are found in mainland Britain south of the Scottish Highlands, in a variety of wooded and open habitats. Adults can be seen April to August.